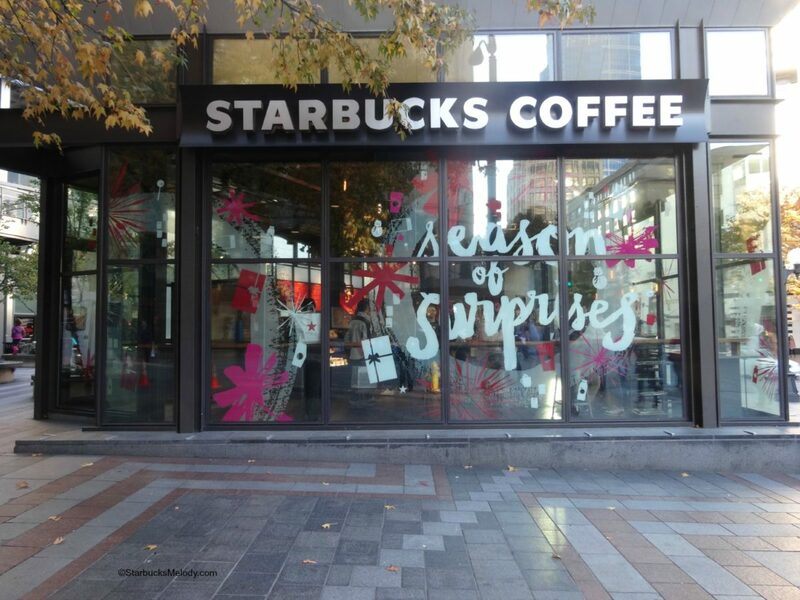 Westlake Starbucks – Holiday 2014 windows! Each year, the Westlake Starbucks in downtown Seattle gets decorated with very unique holiday window clings/ decorations. I’ve been told that there are only about ten Starbucks stores around the country that get these unique window designs. I was running errands in downtown Seattle today and had my camera on me. It’s been a cold, clear day today. I saw this perfect moment to take a couple of photos. This corner of downtown Seattle – Fourth Avenue and Pine Street – is incredibly busy and so I couldn’t believe I got these two lovely photos without an enormous number of pedestrians in front of the store! I don’t have too much to say about these photos. I realize that I take for granted these kinds of Starbucks sights because it’s something I walk past on a regular basis. 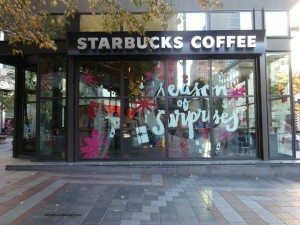 But then I thought maybe you’ve never seen these special Starbucks holiday window designs? What do you think? Hope you enjoy this too! You can read more about the Westlake Center Starbucks here. Starbucks You Are Here Ornaments 2014. (1912 Pike Place Exclusive Ornament). Red Cup Season is Here. 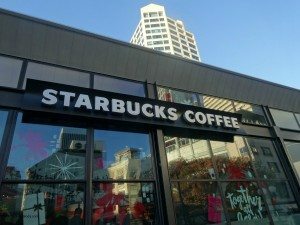 Does anyone remember Starbucks Christmas 2006? Flashback to Christmas 2007 at Starbucks. I’m enjoying all the festive decorations this year. We even have trees in store this year which is the first for a few years.